Screenshot of the hacked homepage of the UK's The Sun. Rupert Murdoch is dead. Okay, not really, but that’s what the website for his own UK paper The Sun is saying. Hacktivists have infiltrated the website of News Corp’s The Sun today and altered the page to re-direct visitors to a faux breaking story about the death of media bigwig Rupert Murdoch. Recently (supposedly) retired Anonymous-offshoot LulzSec posted the message on their Twitter account, asking their audience to clear their Web browser’s cache so that they can be properly directed to the fake posting. LulzSec tweeted minutes later that site hosting the re-directed “obituary” was hit so hard within moments that the site crashed. At around 6:15 p.m. EST, LulzSec successfully caused The Sun's website to redirect to the LulzSec Twitter feed. "Hello, everyone that wanted to visit The Sun! How is your day? Good? Good!" reads the tweet. That message came only minutes after LulzSec also posted hacked internet data from the Sun site. 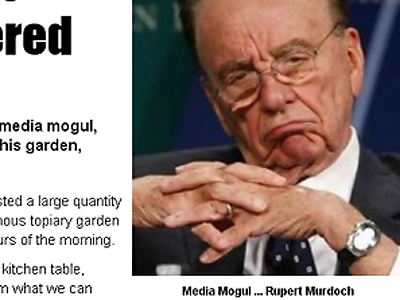 According to the fabricated Sun story, Murdoch was found dead earlier this morning in his topiary garden after ingesting a large quantity of palladium, the silvery-white metal used in fuel cells and photography. "We found the chemicals sitting beside a kitchen table, recently cooked," one officer states. "From what we can gather, Murdoch melted and consumed large quantities of it before exiting into his garden,” reads the statement. The original posting, now temporarily unavailable, shows an image of a befuddled Murdoch sitting with jowls dangling, adjusted to another image of the a hazmat team investigating the media mogul’s yard. LulzSec have applied the hashtag #MurdochMeltdownMonday to their tweet, following up last week’s info leak under the trending top @MilitaryMeltdownMonday. Last week, 90,000 military email addresses, log-ins and passwords were leaked from hacktivists. At around 6 p.m. EST, LulzSec called out Gizmodo.com for inappropriately crediting Anonymous for the hack. Murdoch’s “death” comes the same day that former News of the World contributor Sean Hoare was found dead in England, days after disclosing information on News Corp wiretaps.